Whirling around controversies with IIT’s, government authorities and manufacturers, Datawind the makers of Aakash tablet have today launched two upgraded versions of their existing Ubislate tablet called Ubislate 7+ and Ubislate 7c. Ubislate 7+ was announced few months ago but was delayed due to issues faced with the 3rd party manufacturers. In a new partnership with VMC systems the manufacturing has already begun. As per reports from Datawind the delivery for the first lot of bookings will start by early May. The specs for these tablets are already released along with the pricing information. Ubislate 7+ will be available for Rs 2,999 while the Ubislate 7C will be priced at Rs 3,999. The only difference being, Ubislate 7C comes with a Capacitive multi touch screen while the Ubislate 7+ has a resistive screen. Looking at the specifications, there is absolutely no other difference in these 2 tablets besides the Capacitve Screen in Ubislate 7C. Both offer a 2G GSM simcard slot, which in my opinion is one of the best feature of these tablets compared to their competitors like Micromax Funbook, HCL Me U1, etc which only offer support for an external 3G dongle. This means the Datawind tablet can be used to make or receive calls too. There is also a speculation that Datawind is tying-up with Aircel to provide a 2G dataplan at Rs 98 per month. Pre-booking for these are open for over an year now at Ubislate website. All these specs and announcements will create some hype in the tablet and mobile market, but in the wake of the recent controversies Datawind has been through, this could just be another announcement in the last one and half year. Datawind has delayed its product deliveries more than twice already. They already have orders from the MHRD for the Aakash tablet for over 90,000 units. 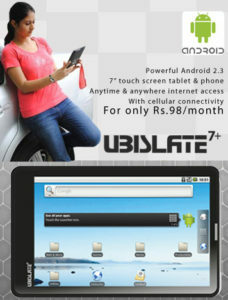 There was also a PR from Datawind in November 2011 which said that the bookings for Ubislate had crossed 22,00,000. Even if half that number is converted into actual sales, with the current manufacturing and delivery model which Datawind has, it could take another year or two to complete all the orders. So, what do you think this announcement will mean in May 2012? Will Datawind fulfill their promise and start shipping their orders or this will be another false promise like earlier? Leave your comments in the section below if you have any queries or thoughts around this announcement. I’d really like to be a part of community where I can get advice from other experienced individuals that share the same interest. If you have any recommendations, please let me know. Thanks! Write to supportin@datawind.com, you will need to send your tablet back to datawind for repair or replacement.